Sometimes it takes a little kick in the seat of the pants to make some life-changing decisions. That’s what happened to Vince Dussetschleger when he bought a new home, blew up his cherished racecar, and learned he was about to become a father — all in the same week. Only a few months prior to becoming an appliance repair technician, Vince was working two jobs, 80 hours a week. But while the two jobs were going nowhere fast, his newborn son was growing up quickly the hours he was away. “I never got to see my family, I wasn’t seeing my son grow up. I would get home at midnight from work and he had learned something new, and I wasn’t there for it.” He realized it was time to look for a career — not just another job — that could provide the security and salary he needed to support his family, yet still allow time to enjoy his growing family and to rebuild his racecar. “I realized I had to grow up, and fast. I was only 22 years old at the time, but it was time to be an adult,’ Vince recalls. 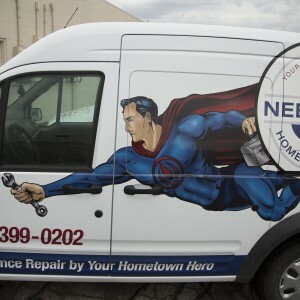 When Nebraska Home Appliance, Omaha’s Hometown Hero, hired him as an appliance repair technician, Vince knew he’d found the career he’d been longing for. Before coming to NHA, Vince was an old hand at working on cars, having studied auto and diesel mechanics, welding, and bodywork. And while appliance repair proved a natural extension of his existing competencies—especially the welding—the specialized training in appliances opened up a new world for him. Vince takes pride in the sense of responsibility and accomplishment he feels every day on the job. “I love repairing appliances, and fixing things in general,” he enthuses. “It’s much more satisfying to fix something than to buy new.” He loves the independence of working on his own in a customer’s home, having the time and independence to figure out the technical problems in front of him. “When you’re out on the service call, you can take your time diagnosing problems because you’re the expert, and you’re out there to get it fixed.” And on the rare occasions when Vince might not have the answer at his fingertips, he has quick access to fellow techs and supervisors at NHA, as well as factory literature and manufacturer hotlines to back him up when needed. Learning appliance repair has given Vince a renewed self-confidence as well, thanks to the interpersonal skills he learned as part of his training program. Understandably, it’s a transition to go from meeting customers in an auto garage, on one’s own turf, to walking into the customers’ homes. But Vince considers that a bonus of his job. “I really enjoy when customers tell me about their lives when I’m working. It makes me feel very welcome in their homes, and I feel like a guest, not a repairman.” And his customers obviously appreciate having him service their appliances, as evidenced by the many positive reviews and praise for his hard work and expertise submitted on customer feedback forms. If you’re interested in exploring rewarding career opportunities at Nebraska Home Appliance, check our our career opportunities page.